The fifth Franklin (CV-13) was launched by Newport News Ship building and Dry Dock Co., Newport News, Va., on 14 October 1943; sponsored by Lieutenant Commander Mildred A. McAfee, USNR, Director of the WAVES; and commissioned on 31 January 1944, with Captain James M. Shoemaker in command. Franklin cruised to Trinidad for shakedown and soon there after departed in TG 27.7 for San Diego to engage in intensive training exercises preliminary to combat duty. In June she sailed via Pearl Harbor for Eniwetok where shejoined TG 58.2. On the last day of June 1944 she sortied for carrier strikes on the Boninsin support of the subsequent Marianas assault. Her planes scored well againstaircraft on the ground and in the air as well as against gun installations,airfield and enemy shipping. On 4 July strikes were launched against IwoJima, Chichi Jima and Ha Ha Jima with her planes battering the land; sinkinga large cargo vessel in the harbor and firing three smaller ships. On 6 July she began strikes on Guam and Rota to soften up for the invasionforces, and continued until the 21st when she lent direct support to enable safe landing of the first assault waves. Two days of replenishment at Saipanpermitted her to steam in TF 58 for photographic reconnaissance and airstrikes against the islands of the Palau group. Her planes effected their mission on the 25th and 26th, exacting a heavy toll in enemy planes, ground installations, and shipping. She departed on 28 July en route to Saipan and the following day shifted to TG 58.1. Although high seas prevented taking on needed bombs and rockets, Franklinsteamed for another raid against the Bonins. The 4th of August bode well,for her fighters launched against Chichi Jima and her dive bombers and torpedoplanes against a convoy north of Ototo Jima rained destruction against theradio stations, seaplane base, airstrips and ships. A period of upkeep and recreation from 9 to 28 August ensued at Eniwetok before she departed in company with carriers Enterprise (CV-6), BelleauWood (CVL-24) and San Jacinto (CVL-30) for neutralization and diversionaryattacks against the Bonins. From 31 August to 2 September spirited and productive strikes from Franklin inflicted much ground damage, sank two cargo ships,bagged numerous enemy planes in flight, and accomplished photographic survey. On 4 September she onloaded supplies at Saipan and steamed in TG 38. for an attack against Yap (3-6 September) which included direct air coverageof the Peleliu invasion on the 15th. The group took on supplies at Manus Island from 21-25 September. Franklin as flagship of TG 38.4 returned to the Palau area where shelaunched daily patrols and night fighters. On 9 October she rendezvousedwith carrier groups cooperating in air strikes in support of the comingoccupation of Leyte. At twilight on the 13th, the Task Group came under attack by four bombers and Franklin twice was narrowly missed by torpedoes.An enemy plane crashed Franklin's deck abaft the island structure, slid across the deck and into the water on her starboard beam. Early on the 14th a fighter sweep was made against Aparri, Luzon, followingwhich she steamed to the east of Luzon to neutralize installations to the east prior to invasion landings on Leyte. On the 15th she was attacked bythree enemy planes, one of which scored with a bomb that hit the after outboard corner of the deck edge elevator, killing 3 and wounding 22. The tenacious carrier continued her daily operations hitting hard at Manila Bay on 19 October when her planes sank a number of ships, damaged many, destroyeda floating drydock, and bagged 11 planes. During the initial landings on Leyte (20 October) her aircraft hit surrounding air strips, and launched search patrols in anticipation of the approachof a reported enemy attack force. On the morning of 24 October her planes sank a destroyer and damaged two others. 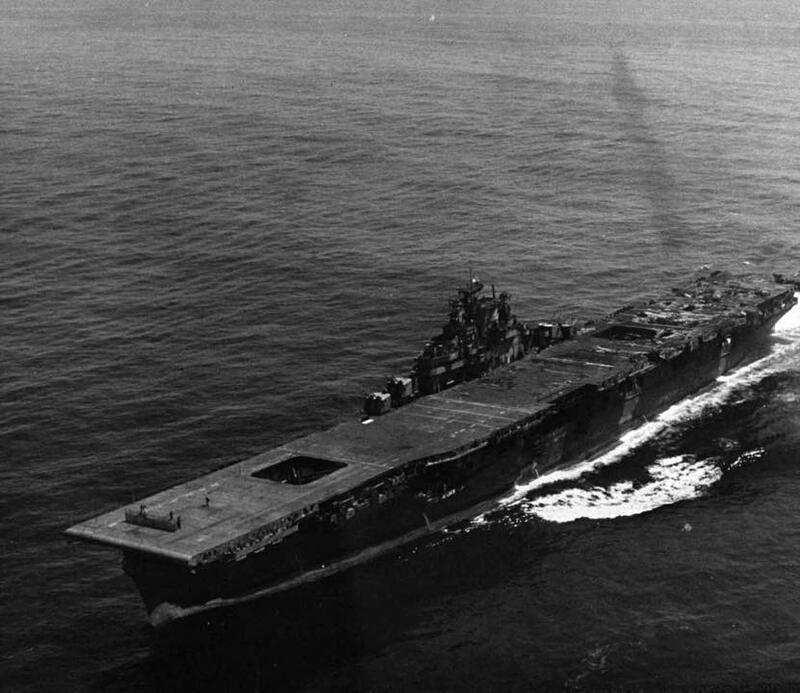 Franklin, with Task Groups 38.4,38.3, and 38.2 sped to intercept the advancing Japanese carrier force and attack at dawn. Franklin's four strike groups combined with those from the other carrier in sending to the bottom four Japanese carriers, and batteringtheir screens. Retiring in her task group to refuel, she returned to the Leyte actionon 27 October, her planes concentrating on a heavy cruiser and two destroyers south of Mindoro. She was underway about 1,000 miles off Samar on 30 October when enemy bombers appeared bent on a suicide mission. Three doggedly pursue]Franklin, the first plummeting off her starboard side; the second hittingthe flight deek and crashing through to the gallery deck, showering destruction,killing 56 and wounding 60; the third discharging another near miss at Franklinbefore diving into the flight deck of Belleau Wood. Both carriers retired to Ulithi for temporary repairs and Franklin proceededto Puget Sound Navy Yard arriving 28 November 1944 for battle damage overhaul. She departed Bremerton on 2 February 1945 and after training exercises and pilot qualification joined TG 58.2 for strikes on the Japanese homeland in support of the Okinawa landings. On 15 March she rendezvoused with TF58 units and 3 days later launched sweeps and strikes against Kagoshimaand Izumi on southern Kyushu. Before dawn on 19 March 1945 Franklin who had maneuvered closer to theJapanese mainland than had any other U.S. carrier during the war, launched a fighter sweep against Honshu and later a strike against shipping in Kobe Harbor. Suddenly, a single enemy plane pierced the cloud cover and madea low level run on the gallant ship to drop two semiarmor piercing bombs.One struck the flight deck centerline, penetrating to the hangar deck, effceting destruction and igniting fires through the second and third decks and knockingout the combat information center and airplot. The second hit aft, tearingthrough two decks and fanning fires which triggered ammunition, bombs, androckets. Franklin, within 50 miles of the Japanese mainland, lay dead inthe water, took a 13? starboard list, lost all radio communications,and broiled under the heat from enveloping fires. Many of the erew wereblown overboard, driven off by fire, killed or wounded, but the 106 officers and 604 enlisted who voluntarily remained saved their ship through sheervalor and tenacity. The casualties totalled 724 killed and 265 wounded,and would have far exceeded this number except for the heroic work of manysurvivors. Among these were Medal of Honor winners, Lieutenant CommanderJoseph T. O'Callahan, S. J., USNK, the ship's chaplain who administeredthe last rites, organized and directed firefighting and rescue parties,and led men below to wet down magazines that threatened to explode, andLieutenant (junior grade) Donald Gary who discovered 300 men trapped ina blackened mess compartment, and finding an exit returned repeatedly tolead groups to safety. Santa Fe (CL-60) similarly rendered vital assistancein rescuing crewmen from the sea and closing Franklin to take off the numerous wounded. Franklin was taken in tow by Pittsburgh until she managed to churn upspeed to 14 knots and proceed to Pearl Harbor where a cleanup job permittedher to sail under her own power to Brooklyn, N.Y., arriving on 28 April.Following the end of the war, Franklin was opened to the public for Navy Day celebrations and on 17 February 1947 was placed out of commission at Bayonne, N.J. On 15 May 1949 she was reclassified AVT-8.